[143 Pages Report] The mobile encryption market size is expected to grow from USD 761.4 Million in 2017 to USD 2,917.9 Million by 2022, at a Compound Annual Growth Rate (CAGR) of 30.8%. The proliferation of smartphones and tablets across enterprises, need for stringent compliance and regulatory requirements, and increased concerns for data security and privacy issues are some of the factors fueling the growth of the mobile encryption market across the globe. The base year considered for this study is 2016 and the forecast period considered is 2017–2022. The mobile encryption ecosystem comprises various mobile encryption solution and service providers, such as Adeya SA (Morges, Switzerland), AlertBoot Data Security (Las Vegas, US), Becrypt, Ltd. (London, UK), BlackBerry Ltd. (Ontario, Canada), CSG, Inc. (Washington, US), Certes Networks, Inc. (Pennsylvania, US), Check Point Software Technologies, Ltd. (Tel Aviv, Israel), DataMotion, Inc. (New Jersey, US), Dell Technologies, Inc. (Texas, US), ESET (Bratislava, Slovakia), Gold Line Group Ltd. (Israel), Hewlett Packard Enterprise (California, US), Huawei Technologies Co. Ltd. (Shenzhen, China), IBM Corporation (New York, US), Intel Corporation (California, US), KoolSpan, Inc. (Maryland, US), MobileIron, Inc. (California, US), Open Whisper Systems (California, US), Proofpoint, Inc. (California, US), SecurStar (Munich, Germany), Silent Circle, LLC (Le Grand-Saconnex, Switzerland), Sophos Ltd. (Abingdon, UK), Symantec Corporation (California, US), T-Systems International GmbH (Frankfurt, Germany),and Zix Corporation (Texas, US). Other stakeholders of the mobile encryption market include mobile security vendors, encryption solution providers, network solution providers, independent software vendors, consulting firms, system integrators, Value-Added Resellers (VARs), and Managed Security Service Providers (MSSPs). The mobile encryption market is expected to grow from USD 761.4 Million in 2017 to USD 2,917.9 Million by 2022, at a Compound Annual Growth Rate (CAGR) of 30.8%. Proliferation of smartphones and tablets across enterprises,need for stringent compliance and regulatory requirements, and increased concerns for data security and privacy issues have led to the increased demand for mobile encryption solutions. The mobile encryption market has been segmented based on components (solutions and services), applications, end-user types, deployment types, verticals, and regions. 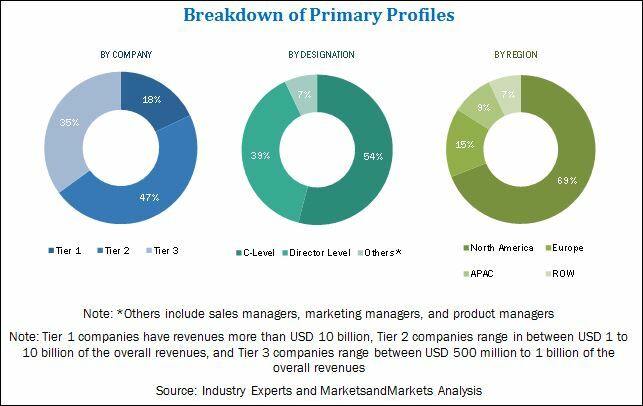 The services segment in components is expected to grow at the highest CAGR during the forecast period, while solutions are projected to have the largest market size in 2017, in the market. Security systems have to be upgraded on a regular basis to counter the newly available threats, attacks, ransomware, and sophisticated cyber criminals. As a result, companies are rapidly outsourcing their network security concerns to specialized service providers known as Managed Security Service Providers (MSSPs). Thus, among the services, managed services are expected to grow at the highest CAGR during the forecast period. Cloud encryption is expected to grow at the highest CAGR during the forecast period in the applications segment owing to the ongoing expansive adoption of the cloud among companies across the world. Increase in the intensity and volume of cyber-attacks has further amplified data security concerns for organizations that have adopted cloud for data storage. This has encouraged the adoption of cloud encryption to safeguard sensitive information from security breaches and thefts. Disk encryption is estimated to have the largest market size in 2017. The increasing BYOD trend needs adoption of strong encryptions, which can protect confidential data, even if the device is lost or stolen. The Small and Medium Enterprises (SMEs) segment is expected to grow at the highest CAGR in the mobile encryption market during the forecast period. The medium-sized companies are significantly growing in this market since mobile encryption solutions allow SMEs to protect their data and business information and provide secure real-time access facilities. Moreover, these solutions are available at economical pricings through the cloud. The cloud deployment type is expected to grow at the highest rate in the mobile encryption market during the forecast period. This type of deployment requires less capital investment, offers high scalability, and is available through subscription-based pricing models, thus, having the fastest growth rate and the largest market share. North America is expected to have the largest market share in 2017, whereas the Asia Pacific (APAC) region is expected to grow at the highest CAGR from 2017 to 2022, in the market. This is mainly because the organizations in the developed economies of the US and Canada are highly focused toward the early adoption of innovative solutions obtained from research and development in security technologies. 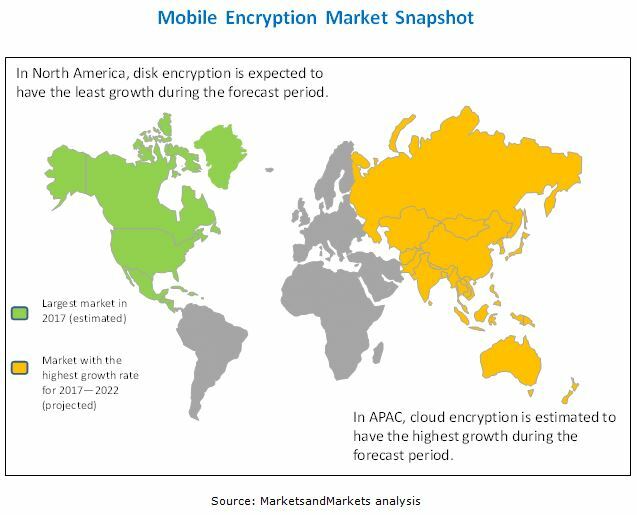 The APAC region is expected to be the fastest-growing region in the mobile encryption market. Rising need to defend against advanced cyber-attacks and increasing adoption of cloud-based solutions drive the regional market growth. The adoption of mobile encryption is increasing in the market owing to the exponential rise in the number of smartphones and tablets. However, increased operational expenditure, budget constraints, and lack of awareness are acting as barriers to the adoption of mobile encryption solutions. The major vendors in the mobile encryption market include Adeya SA (Morges, Switzerland), AlertBoot Data Security, Inc. (Las Vegas, US), Becrypt, Ltd. (London, UK), BlackBerry Ltd. (Ontario, Canada), CSG, Inc. (Washington, US), Certes Networks, Inc. (Pennsylvania, U.S.), Check Point Software Technologies, Ltd. (Tel Aviv, Israel), DataMotion, Inc. (New Jersey, US), Dell Technologies, Inc. (Texas, US), ESET (Bratislava, Slovakia), Gold Line Group Ltd. (Israel), Hewlett Packard Enterprise (California, US), Huawei Technologies Co. Ltd. (Shenzhen, China), IBM Corporation (New York, US), Intel Corporation (California, US), KoolSpan, Inc. (Maryland, US), MobileIron, Inc. (California, US), Open Whisper Systems (California, US), Proofpoint, Inc. (California, US), SecurStar (Munich, Germany), Silent Circle, LLC (Le Grand-Saconnex, Switzerland), Sophos Ltd. (Abingdon, UK), Symantec Corporation (California, US), T-Systems International GmbH (Frankfurt, Germany), and Zix Corporation (Texas, US). These players have adopted various strategies such as new product development; mergers and acquisitions; partnerships, agreements, contracts, and collaborations; and business expansions to cater to the mobile encryption market.